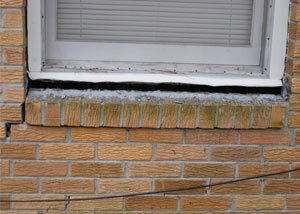 If these sound like familiar foundation problems, call the experts at Total Foundation Solutions today to get an expert evaluation and foundation repair solution. We offer free estimates on all our services in Erie, Edinboro, Warren and throughout the surrounding areas. The solution: At Total Foundation Solutions, we address foundation settlement issues by installing foundation piers at key locations. 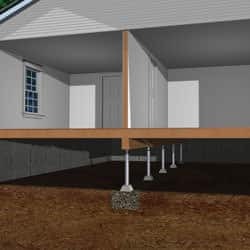 The piers extend to stable, load-bearing soil, attached to the foundation with steel brackets. 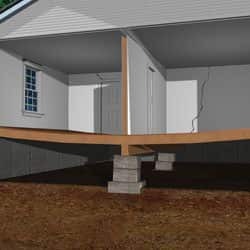 This repair work prevents further settling -- and can even allow the foundation to be jacked back to its original position. Once the foundation is raised back up, cracks in the wall will close. Doors, locks, and windows may return to functionality, and further settlement damage will halt. 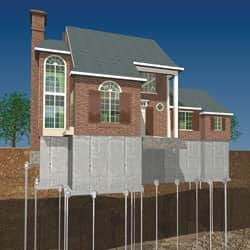 We offer two different types of foundation piers to address foundation settlement: push piers and helical piers. With either installation, there's a 25-year manufacturer's warranty, as well as our own performance warranty. If you have a problem with your foundation, we can help. At Total Foundation Solutions, we offer free, no-obligation foundation repair quotes within our Pennsylvania and New York service area. Each free quote includes an on-site inspection, personal consultation, and written estimate. To schedule your free quote, call or e-mail us today! We proudly serve Warren, Erie, Edinboro, surrounding areas such as Meadville, Fredonia, Jamestown, Olean, Du Bois, Harborcreek, Hermitage, and nearby.